Barbecue Master: What does Shania Twain Do with Her Bag Balm - and grillers and smoker can use it too! What does Shania Twain Do with Her Bag Balm - and grillers and smoker can use it too! 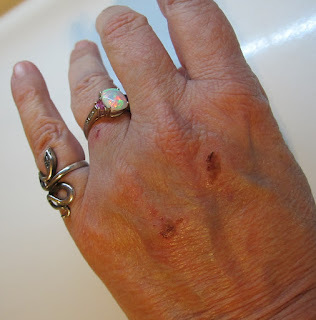 Hand Boo Boo - What Do I Turn To? - Bag Balm - Yep - It's the Best. Bag Balm has been selling like hot cakes (not to be confused with cow patties). At one point, the entire year supply of 30,000 tins sold out in one month. You can imagine that this came as quite a surprise to the Bag Balm makers in Quebec Canada though the product says “Vermont’s Original." 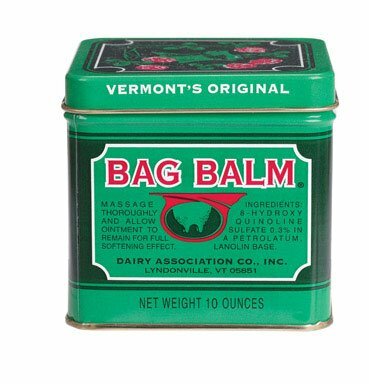 What the Heck is Bag Balm? If you have a cow, and your cow has teat problems, then you go buy some Bag and Balm. Cow owners have been treating dry and cracked cow udder and teats with Bag Balm since 1889. Bull owners might use Bag and Balm for barbwire cuts and such, but bulls do not have teats. And I won’t even explain that one. If you are a little confused on the cow terminology, the udder is the big bag and the teats are the milkers hanging down. Those are between the back legs and come as set. My city cousin drew his cow with the apparatus between the front legs which is still a family laugh after 25 years. When you live on a farm, you often "make do." It’s not unusual for farm folk to try out the animal meds. Although I grew up in the city (if you can call a town of 800 with pig pastures behind houses on Main Street a city), my grandparents on both sides were small time farmers with day jobs. Bag Balm was in the bathroom cabinet at Grandma’s along with iodine, Pepto Bismal, and Bayer aspirin. It was considered a staple item and certainly more pleasant than the iodine. Bag Balm is pretty much like Petroleum jelly but with a mild analgesic and protects your chapped hands or whatever might be chapped when you're grilling. It helps block the pain after application and then stays on and protects the cut, burn, sunburn. We used it like Neosporin, and it is much cheaper than Neosporin. Another alternative was aloe plant which Grandma grew in the window. Bag Balm is not a NEWS FLASH for most rural families, but it is unusual to begin seeing Bag Balm in department stores and at the drugstore. I wondered what was up with all that. Then I read that Shania Twain mentioned that she used Bag Balm as a moisturizer on her face and hair. She probably didn’t even think much about that off-the-cuff remark, but it sure did run the sales up for Bag and Balm. Personally, I would not rub Bag and Balm on my face or in my hair. I have somewhat oily skin on my face, and I am sure that this thick jelly stuff would hold all that in and give me breakouts. Zits were bad enough in high school, and I don’t want to revisit pimples. As far as my hair . . . again I have a good supply of oil. I would imagine that Bag and Balm would be one more mess rubbed in my hair. Now, I might spot clean one of the boys to get bubblegum out of a section of hair though I tend toward peanut butter and ice for those days. If I need moisture, I’ll stick with garden-variety conditioner. Is Bag Balm Safe? You Decide. I'm Fine with it for 50 Plus Years. If you’re thinking about trying Bag and Balm, then you should know that it is not FDA (Food and Drug Administration) tested or approved for human use. The product is marketed for animals and does not need to be checked out for human use. With humans being humans, many people have tried Bag and Balm. Since Shania shared her beauty tip, even more human folks have headed to the local feed and seed store to find the green can which comes in a pocket 1 oz, a regular 10 oz for the cabinet and the bucket size. The official word is that you shouldn’t use animal products on people parts. Since creative people have been using Bag and Balm for over 100 years, I wouldn’t worry much about it. I find that it works for small boo-boos and also helped tremendously when I got a case of mastitis. Mastitis is when you try to breast-feed your baby and get clogged up. You feel like a truck parked on your chest, and you will try most anything. I do draw the line on my face and hair. This is gooey smelly stuff that seems better suited to more discrete areas of the human body. You should also know that you should not take Bag Balm internally. I would think the texture and smell would tell you that though. For my griller friends, if you get chapped up hands, the Bag Ball is soothing and heals well. I swear by it, and you know I don't really swear. It's good healing ointment. One bonus with Bag Balm is that you have a nice tin when you are done. It does take a heap of scrubbing to get the last of the balm out. Once clean, you can use it for your screws and nails or other small items.